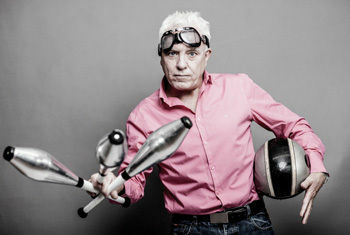 Dave Spikey is currently celebrating the 30th anniversary of his comedy career with a brand new tour JUGGLING ON A MOTORBIKE, which comes to King’s Hall, Ilkley on Thursday 15 February 2018. JUGGLING ON A MOTORBIKE will see the Lancashire based comic look back on his remarkable life and incredible journey from working class lad to Chief Biomedical Scientist, and then to much loved comedy performer and writer via Phoenix Nights, Eight out of Ten Cats, Bullseye, Dead Man Weds, Magnolia, The Royal Variety Show, Parkinson and many more. Dave Spikey had been working in the NHS for 19 years as a Biomedical Scientist when in 1987 someone uttered the immortal words, “You’re really funny, you should be a comedian” and for some reason, he took them seriously. Only a few short months later he was crowned the winner of the national talent show Stairway to the Stars. Larry Grayson, one of the judges, told him that it was a close run thing on the night but what clinched the award for Dave was his routine about a juggler on a motorbike. Fast forward 13 years to Friday 13 October 2000 - the day Dave switched off his microscope for the last time in the Haematology Laboratory. The following Monday he found himself sitting on a rain-swept local car park dressed as a giant Berry! Dave often reflects that maybe none of this would have happened and he might still be looking down his microscope today if it wasn’t for the juggler on a motorbike!